Welcome to the It's Time to Get Crafty Giveaway Hop, hosted by the Blogging Mamas Network. With the colder weather keeping us inside, it's the perfect time to get crafty! I’ve joined with over 40 other bloggers to bring you great products to keep you or your kids busy this season. This event will run from February 6-20 and each blogger in the hop has a great prize, worth at least $25, to help you be creative or to admire someone else's handmade creations. 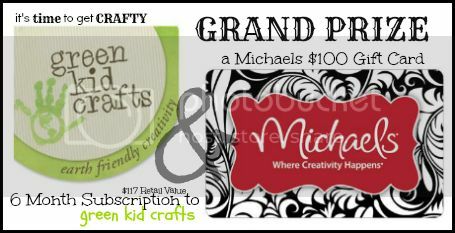 While you're hopping, be sure to check out the Grand Prize for this Event - a 6 month subscription to Green Kid Crafts AND a $100 Michaels Gift Card! 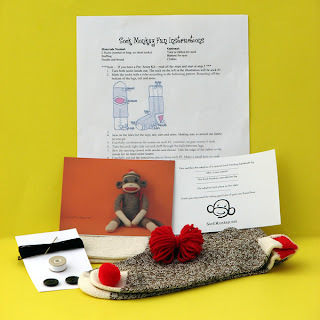 A Year of Jubilee Reviews if offering a Creative Sock Monkey project for you to make on your own, as well as a Creation from Sassy Secrist Crochet that is already made for you to admire! Be sure to check out the sponsor review posts and leave a comment for additonal entries into the giveaway! According to Jenny, So Easy Being Green, and the Time to Get Crafty participating bloggers are not responsible for sponsors who do not fulfill prize obligations. I like to knit and make paper crafts. i make windchime from silverware and more recently little projects with my little dude! One of my favorite things to do as a kid was 3D Rip Art. All you need: Colored construction paper and glue. Start with blue paper, maybe. Rip off a strip of green for the grass. Rip out a ghost from white. But hey, let’s make that ghost a little more scary. Rip him out another layer and make him pop off the page! I love to make handmade soaps, and currently I'm cutting mats for cross-stitch pictures! I decorate fancy cakes, paint, knit, amd lots more. mostly I sew, but I love to make things, or repurpose old "junk" into new treasures. I get crafty when I'm inspired by something on Pinterest. I collage and sew and make jewelry and tie dye and I do all kinds of things! I'm a huge diy'er I even have diy tattoo. Mostly kid friendly crafts, stuff to do together. But I also sew, scrapbook and crochet. Oops signed into wrong acct. I'm Melissa Alexander on the rafflecopter! I mostly sew but I like to dabble in a few things. 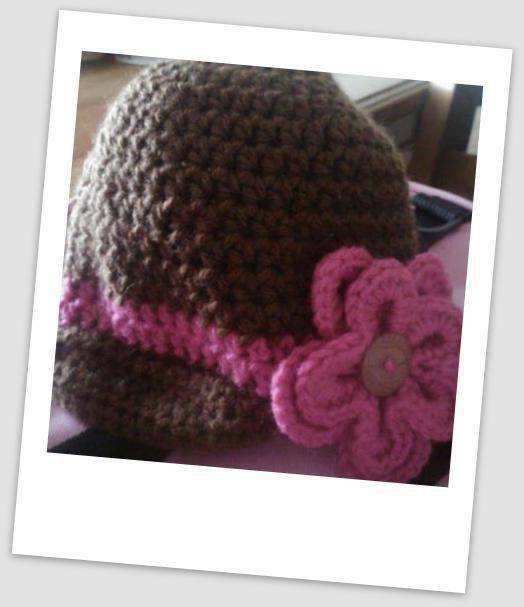 Knit, crochet, paint,cook, so many ways I dabble its hard to list them all! I like to sew - mostly quilts and some accessories/baby items. We use Pinterest for great ideas. I like to do things with paper! I decorate the front porch. With my grandkids, we bring out the tape, stickers, paper, cereal boxes...and just go crazy! I love to scrapbook, bake cakes & cupcakes, draw and cross stitch! I like to get crafty with my kids. We will try anything! Right now, my girls and I are taking crochet lessons, which is really fun. Thanks! I like to decorate plain wood photo frames to match the photo. I scrapbook, make greeting cards, and do a little embroidery! I am not very creative, but I try! I love sewing and handprint art with my son! I love making costumes for my kids. I sew, embroider and crochet. I love making tutus and bows! I like painting and coloring with the kids. I do crafts with my kids. I usually buy the box crafts found at Wal-Mart that include painting and making things. oh do we love sock monkeys around here! welli am trying to get crafty by learning to sew. wish me luck! I crochet and I am teaching myself to knit as well!! I love to do needlework. I love to collage with my daughter! I am not very crafty...trying to learn new things these days. Origami and Crochet. I want to learn how to sew so bad. I do a lot of beadwork. i like to crochet, quilt and make wire wrap jewelry. Used to do plastic canvas and scrapbooking, but no time anymore. I get crafty with my children during our homeschool. We do a lot of kids crafts and I like to scrapbook and just bought a sewing machine! I make a lot of stuff with my kids by recycling different items. I scrapbook and make my own greeting cards. I make a lot of other things now too, depending on whats going on. I love making gifts. I'm learning to sew, knit and crochet!! I make decorative vase out of jars and paint and glue gun tacking. 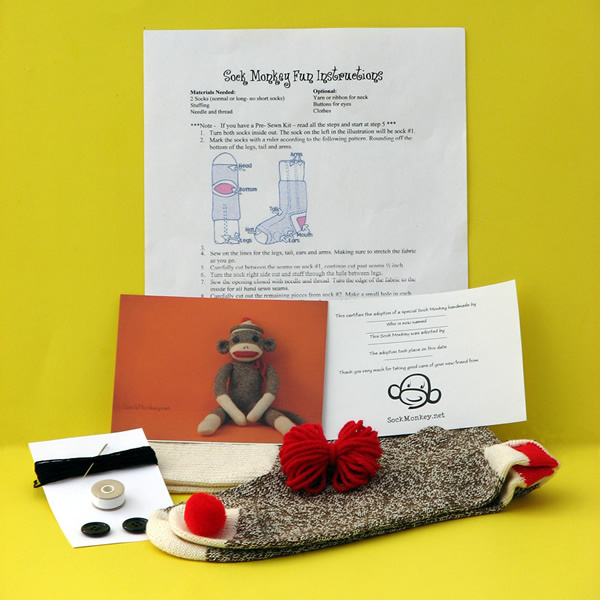 Do It Yourself Sock Monkey Kit; my eyes are getting so bad that sewing on the machine is really hard though hand stitching I can do. I'm a quilter/sewer and a crocheter! I love to make record bowls, headbands, pillows, guitar pick earrings, etc. I like to try to be creative and use recycled materials to make all sorts of different things! I like to sew clothes for my family and am learning to crochet! I get crafty with family photos making collages and music videos. Love all kinds of crafting, mostly love quilting and paper like scrapbook and cards. My kids absolutely love doing Perler Bead projects. We look up patterns online, buy pattern books, get lots of beads and just go for it! Make ornaments,candles, and lots of other stuff. Now a days, crafted & handmade things love by peoples. Soy Candles are good and give you tremendous fragrance, which make you feel like haven.